The first Mapperley colliery shaft was sunk in 1872, known locally as "Simon Pit", it remained in operation until 1965. In 1891 the Company extended its mining operations to neighbouring Stanley; a lease was agreed with William Drury Lowe of Locko Park to mine the Kilburn coals, resulting in sinking a second shaft on the site beside West Hallam Station in 1895. This Stanley Colliery was known as "Nibby Pit" until it closed in 1959. From these two collieries 66 men lost their lives in the 1914-1918 war. The Company decided to provide a Memorial Hall to be used by residents from the surrounding villages, with Tennis Courts and Bowling Green. The hall was opened on Station Road, West Hallam in 1920. The Mapperley Colliery Sports and Past-times Club was established making use of these excellent facilities. With the Nationalisation of the collieries all buildings not connected to the actual mines were sold to private individuals. The hall was refurbished and renamed the Silver Jubilee Club in 1977 follow the Queens 25th Anniversary celebrations. Unfortunately the building and facilities deteriorated during the 1990’s and it was finally demolished in 2005 making way for the housing development Jubilee Court. 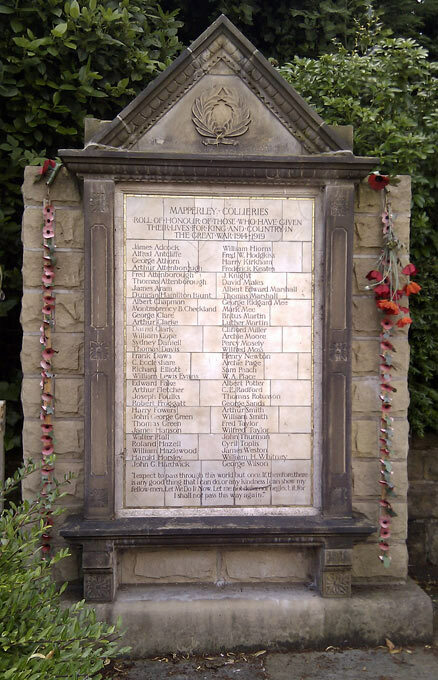 The Roll of Honour was removed by the builder; plans are in hand to relocate it beside the West Hallam village War memorial. The memorial is constructed of a series of glazed tiles, with a stone surround, said to represent the interior of a colliery winding engine room. On May 15th 1922 the Lych Gate was unveiled by Captain Drury Lowe at the entrance to the churchyard, dedicated to the memory of the men who died from the village in the Great War. 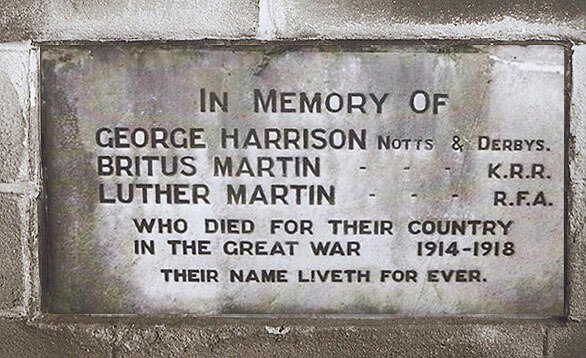 "In memory of George Harrison, Notts, and Derby; Britus Martin, K.R.R., Luther Martin, R.F.A., who died for their Country in the Great War 1914-1918. Their names liveth forever." It is constructed of substantial oak beams with a tiled roof, surmounted by a cross, the entire structure resting on a stone base. In bold, carved letters, the inscription: "In Memoriam" is located on the cross beam, meeting visitors as they approach the gate. The structure was erected by Mr R Slaney from High Lane, West Hallam, to plans drawn by the architect Mr H Tatham Sudbury of Ilkeston. The Sherwood Foresters Band from Derby accompanied the singing of two hymns, "Stand Up, Stand Up for Jesus", and "For All the Saints". A detachment of officers and men from the regiment supplied the firing party, with the guard of honour formed by the Ilkeston St. John Ambulance Corps. This was followed by the Last Post, the ceremony closing with the National Anthem. Among the guests was Mr Quarrell (Chairman of the Mapperley Colliery Company), Major B H Beaumont Checkland and Mr G Spencer all representing the Colliery Company. 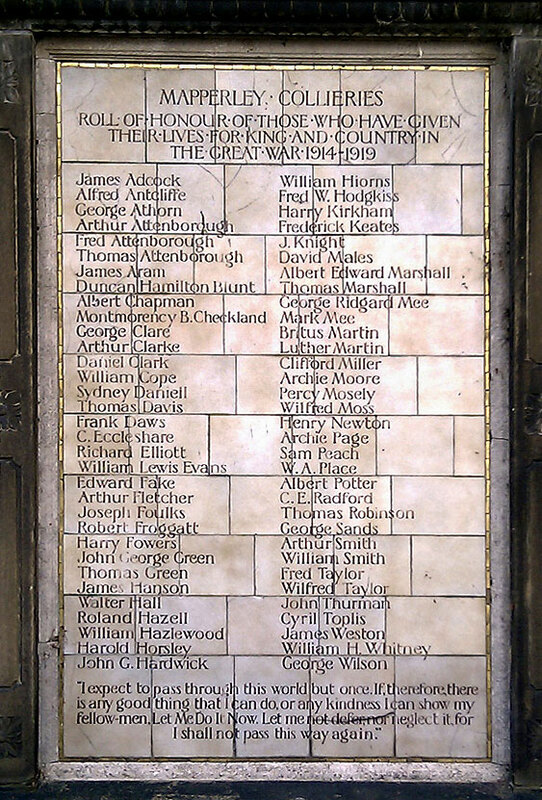 Both Britus and Luther Martin worked at the colliery and their names also appeared on the former Station Road Company's War Memorial (soon to be re-erected in West Hallam village). Following the last war the names of the fallen from the village were placed on an additional tablet, also situated inside the gate. "In Memory of William Joseph Cliffe, Oxd.& Bucks. Lt. Infantry. Thomas Earnest Bridges, Sherwood Foresters. All They Had - They Gave." Killed in action, no known grave. Son of Thomas and Sarah Harrison, Mapperley Brook, Derbyshire. Note: Sarah died and Thomas moved to Yew Tree Farm, Stanley, Derbyshire. Son of late Henry and Mother of Fanny Martin, Park Hall, Mapperley, Derbyshire. Note: Brother of Luther Martin (below). Also named on Lych Gate Memorial and named on Mapperley Colliery Memorial (Church Gates) West Hallam, Derbyshire. Memorial: Ypres Menin Gate Memorial, Leper, West-Vlaanderen, Belgium. Panel 51 and 53. Note: Brother of Britus Martin (above). Also named on Lych Gate Memorial and named on Mapperley Colliery Memorial (Church Gates) West Hallam, Derbyshire. Memorial: Buried. St. Pol Communal Cemetery Extension. Pas de Calais, France. Plot/Row E. Grave 25. I had a desire to visit some of the war graves of Mapperley men, mentioned on the memorials under the church lych gate in Mapperley, who died in the 2 World Wars and when we were nearby, Kay and I visited the grave of Luther Martin at the town of St Pol sur Ternoise, and it is about 20 kilometres from Arras. There are 2 sites in St Pol where there are British war dead:- The community cemetery at the top of the Rue du Cimetiere and slightly to the right. Here there are civilian, usually French graves, plus French military graves with Christian and Moslem soldiers lying side by side, unsegregated, with their appropriate religious symbols on their headstones, and, separately, British soldiers. This is where Luther Martin is buried. Here are also the graves of 3 soldiers of the Durham Light Infantry who broke, after years of shellfire, and threw down their weapons. They were shot at dawn for this offence!!! Nowadays this condition would be recognised as shell shock! This site eventually reached full capacity and a further military cemetery was started in, I think 1918, in St Pol. The cemetery is definitely not in Calais as, I believe, is stated on or in connection with the Colliery Memorial. However.it takes less than 1 1/2 hours to get to St Pol sur Ternoise if one travels on the Autoroute des Anglais from Calais. Luther's brother, Britus, who fell in the same war!!! !, does not have a known grave but he is, I believe named on the Menin Gate in Ypres, where there is a commemorative service with bugles, etc., every evening. 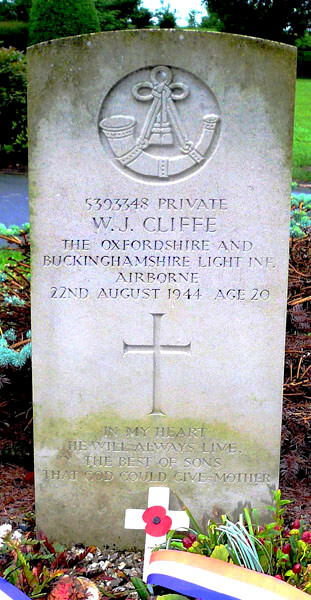 William Joseph Cliffe, Oxd. and Bucks. Lt. Infantry - Age 20. Died 22nd August 1944. Son of Annie Cliffe and stepson of Ernest Albert Moorhouse of Jersey. Thomas Earnest Bridges, Sherwood Foresters - Age 25. Died in a Japanese POW camp 12th September 1944. Son of John and Hannah Bridges of Mapperley. Desmond Martin - He went to war and later came back home injured. He recovered and went back to war. Albert Hartshorne believes Desmond was killed in France in a transport lorry which was blown up by a landmine. All They Had "They Gave. I was very pleased to receive an email from the half brother of William Joseph Cliffe. His name is Anthony William Cliffe and he lives in Rugeley Staffordshire, but was born in a small village called Kings Bromley. Last year he visited Mapperley to take photographs of the Memorial tablets on the wall under the Lych Gate at church as his half brother is remembered there. 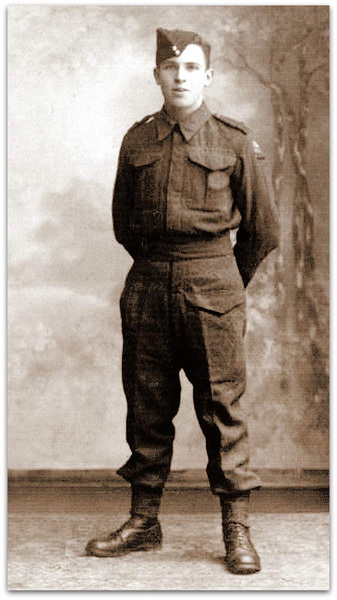 William Joseph was born in 1924 and died so young at 20 years of age during World War 11. He died in Vauville in France on the 22nd August 1944. 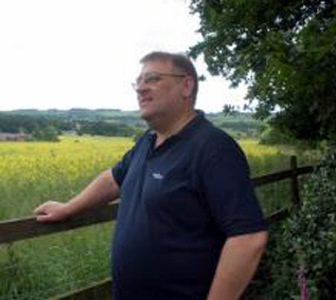 His last known address was Head House Farm, Mapperley. 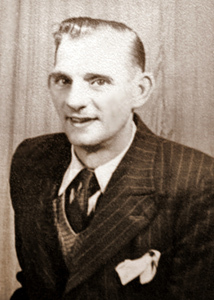 His father was William Cliffe who was born in 1904 and died in 1985. He married Annie Dale, they had William Joseph, Joyce and Betty Cliffe. In 1946 William then married Anthony’s mother Roseiltha Yates born 1919 died 1984. Their family was two sons and two daughters, all live local. Frances Betty born 1928 and married Roy Moorhouse born 1928 died 2010 in Australia. Their family was two sons. 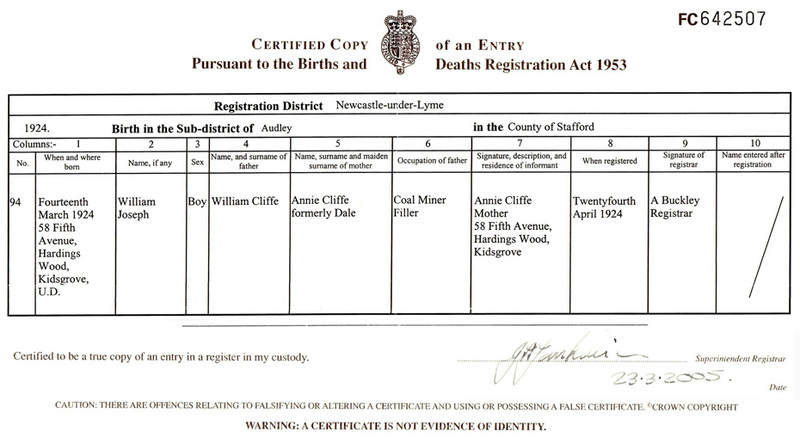 The photo of William Joseph, opposite and his birth certificate above. 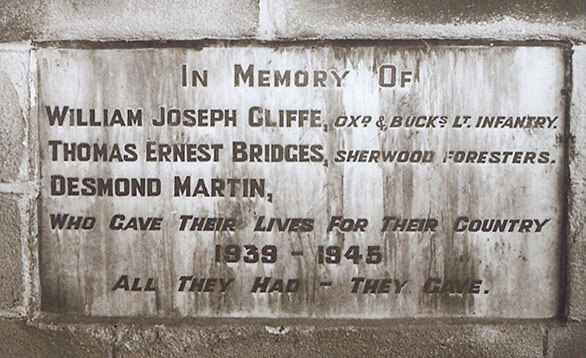 Both Britus and Luther Martin worked at the colliery and their names also appeared on the former Station Road Company's War Memorial. (Now erected in West Hallam village beside the main memorial. Sixty-six men from the colliery company are named on this memorial).